I spent two days in December meeting with Sustainability Directors from around New England. While we met, pounding rain drenched late arrivals, and rain and snow storms to our north waylaid some of our colleagues. Three to four inches of rain was threatening many of our cities and towns in the North East. This group meets, with support and coordination from the EPA, twice a year to talk about sustainability issues our communities are dealing with. Last summer we learned about the green infrastructure some New England communities are installing to handle increased volumes of storm water and to get our water cleaner before it gets to rivers and the ocean. We looked at rain gardens and native planting used to withstand drought conditions and manage water from sudden downpours. This time we met to talk about planning for adaptation and changes our municipalities need to make to deal with increased storms, threat of storm surge and increased temperatures in our cities. We understand that when we talk about global warming, we’re talking about averages across the entire planet, and not just temperatures in our communities. When the entire planet warms up, it causes effects that we feel locally – not necessarily warmer temperatures locally – but changes that impact local residents. Scientists have found that the sorts of trees and plants that flourish in each region are changing because the average temperatures and freeze and thaw dates are changing. We have been finding that the amount of rain and snow that fall in our area is changing and that storms are getting more severe. For example we’ve been advised to start planning for an additional 10” of rain annually and to expect “100 year storms” to occur more like every 10 years. Overall, we’re finding that what we’re used to stops being what “always happens” and we have to adapt our behaviors, and as a city, we have to adapt our infrastructure and storm response. 2014 was the hottest year on record for the planet since we started keeping records in 1880. The Global average land temperature for 2014 was 1°C and 1.89°F above the 20th Century average temperature. The people I meet with are people who have been on the forefront of combatting climate change at the local level for many years. 10 years ago our cities were winning awards for writing climate change plans, installing solar and putting up wind turbines. Now, these actions are expected, not noteworthy. The climate changes plans we used to write were about what our communities would do to reduce our green house gas emissions. Today, our plans need to be about what we are going to do to protect our residents from flooding and mitigate the heat island affects of our urban areas, such as the plan Cambridge, MA has been working on. We are not kidding ourselves, these changes are coming because of green house gas emissions. We are still working to reduce our emissions. 5 years ago when I started working in local government we were making commitments to reduce the green house gasses produced by our municipal buildings and vehicles. We were setting an example and figuring things out. These days communities are making commitments and to reduce the green house gases produced by everyone in our community. Somerville, MA has declared that they want to be emissions neutral (net zero) for their entire population by 2050. We need large sweeping change to stop, if not reverse, climate change. According to NPR the US produces 19 tons of carbon per person per year and the next two largest emitters producer 8 and 2 tons of carbon per person per year. We continue to work to reduce the green house gases of our communities. In Massachusetts, industry buys and sells the rights to produce green house gasses – called the Regional Greenhouse Gas Initiative. Money from this is used to expand production of energy from renewable energy. Everyone pays a percentage of their electric and natural gas bills into a fund that is used to incentivize and help property owners to make their buildings more energy efficient. As we sat in our meetings a major Nor’easter hit New England. We joked about making adaptations to our plans for the day to accommodate the storm, but it was a painful humor because it made what we were discussing so much more real and urgent. We talked about what we need to do to make our municipalities ready for the changes that are coming because of climate change. We heard from the city of Cambridge which reported on the studies it they did looking at increased flooding. 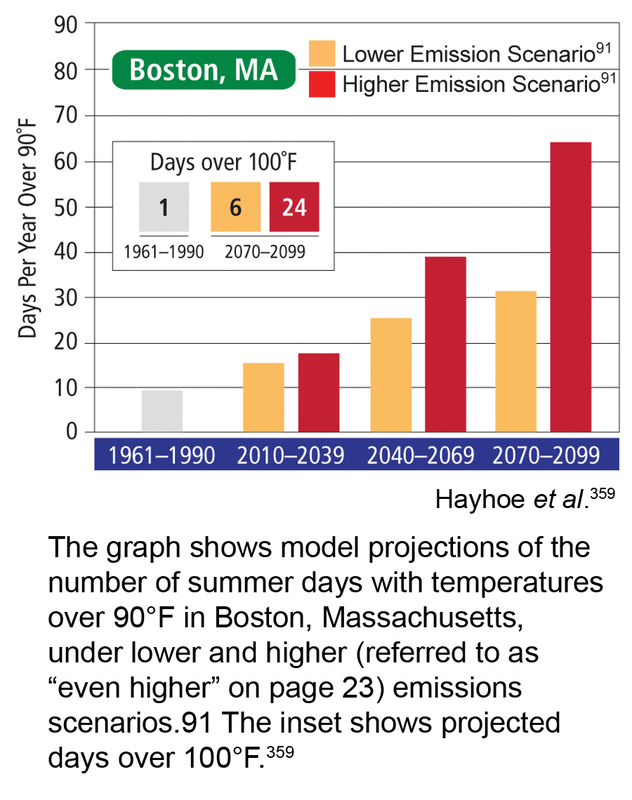 In 15 years it is expected they will see a significant increase in the number of days over 90°F in Cambridge Massachusetts. We heard from three communities that participated in a the study with MIT about how they could better communicate with their residents about climate change and raise awareness about changes that would need to be made in their communities. One of the things they found in that study was that a significant number of the residents are already concerned about climate change. Residents don’t know who will be making changes to help them adapt to the changing climate, but they are aware it is necessary. For several years we’ve been afraid of scaring our residents by talking about changes that are coming and changes that need to be made. It turns out that the residents know change is coming, now they need someone to act and coordinate these changes. The Federal and State governments want to help support adaptation changes, but most actions will need to be done at the local municipal level. When it comes to enlarging storm drains, building sea walls, clearing snow and setting up shelters, it is the local municipalities who will be on the front lines making those changes. Here in Massachusetts we know that the time to act is now, when the need is here, but before it is too late.